I remember leaving WP24 feeling very conflicted. While I appreciated the attention to detail the kitchen brought to Chinese food, the marginal improvement in overall quality didn't warrant the high price premium over more traditional restaurants. The one thing WP24 did excel at was their dim sum, inventive and delicious, the small bites captured the best of what fusion cooking can achieve. With that in mind when I saw Puck's East Coast version of WP24, The Source, ranked #3 in the city by Washingtonian, I felt compelled to try it. While the restaurant's dinner menu bears a striking similarity to WP24's the dim sum was almost entirely different so I felt opted for the Dim Sum Brunch rather than a complete dinner tasting. 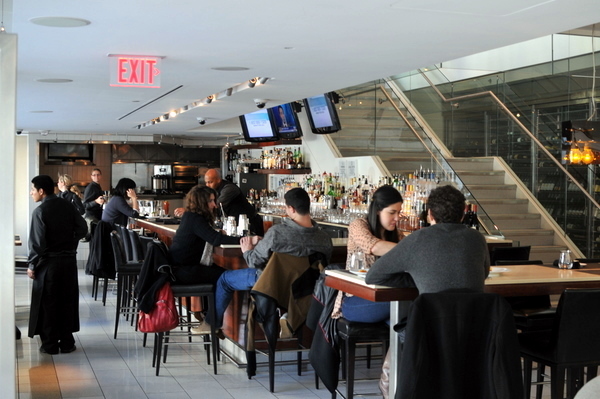 Located in the Newseum, the restaurant features two levels; a bar and lounge comprise the ground floor while the second floor houses the dining room proper. 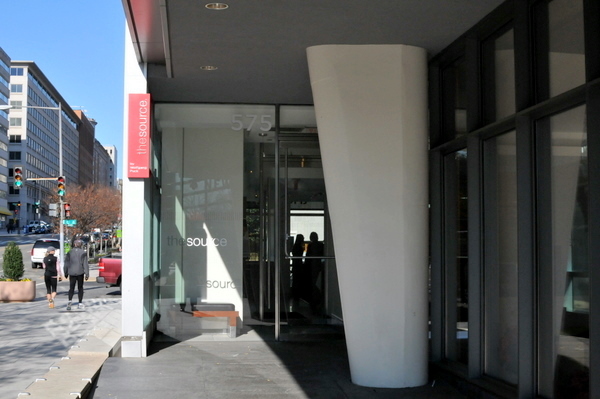 The Source's kitchen is headed by Scott Drewno, a veteran of Puck's Chinois as well as Vong and Ruby Foo in New York. Despite his Polish background, much of Chef Drewno's professional has been in Asian Fusion, making him well-suited to his current position as The Source's Executive Chef. The meal started off quite strong. 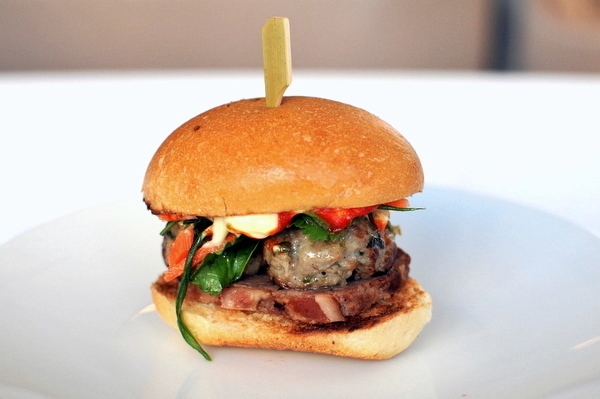 The smoky smack of the pork meatball is augmented by the rich mouth feel of the pate and creamy mayo. The pickled vegetables provide some much needed levity and contrast though I would have liked them to be even more prominent. 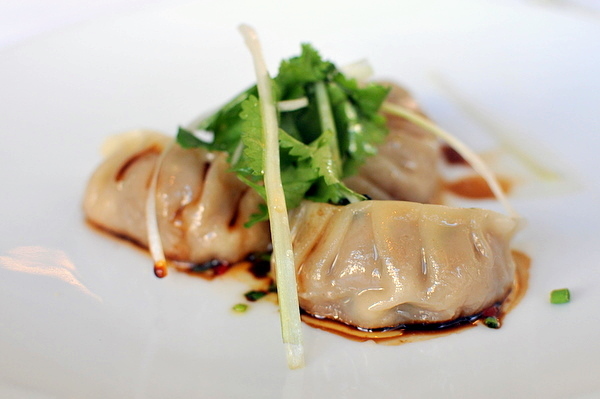 The Crystal Chive Dumplings were one of my favorites from WP24 and one of the strongest of this octet as well. 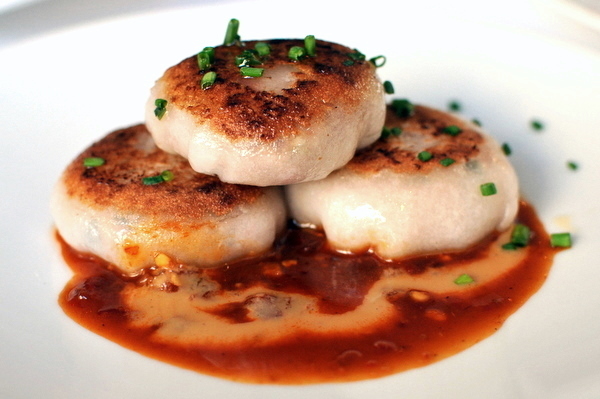 I quite enjoyed the dense toothsome texture of the skin in conjunction with the slickness of the stuffing while the sauce adds a spicy piquant cast to the shellfish-tinged sapor of the dumplings. It is rare that I complain about a dish featuring poached egg, but the hash was probably the biggest letdown of the entire meal. 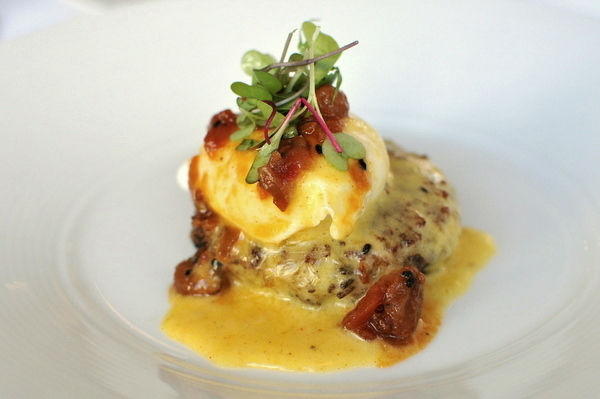 Though the egg was enjoyable, the hash was mealy and bland. Any distinctiveness the Kobe beef might have brought to the table was smothered by the oppressive weight of the curry sauce. Scallops and lobster made this sound special, but reality fell a bit short. 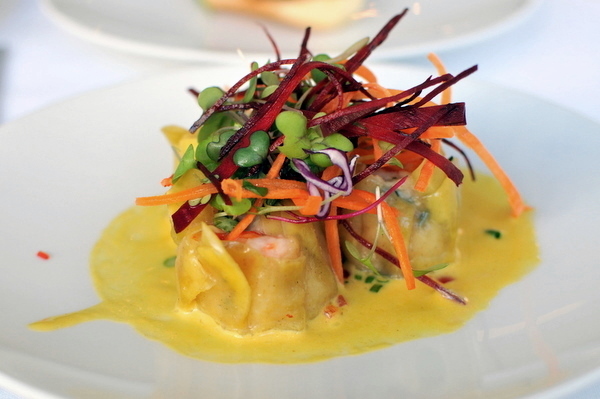 Though the filling was tasty, neither the texture nor flavor were reminiscent of sea scallops. Moreover the wrapper felt a bit dry as if the dish had sat for a while after being prepared. I've never had success with pork belly potstickers. Instead of the unctuous decadent character of pork belly the filling tastes decidedly normal. 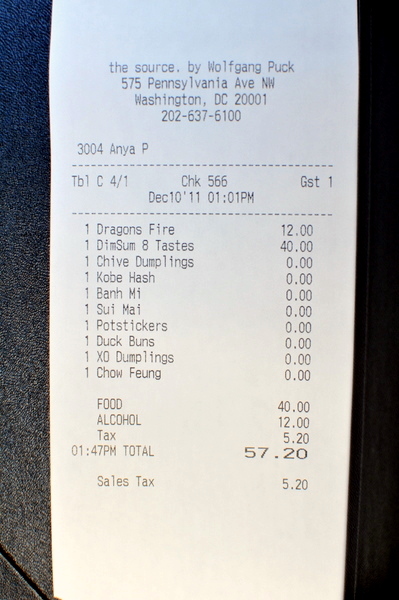 Though the dumplings were well made, I can get very good dumplings for much less than the $5+ The Source charges for 3. I'm a sucker for chow fun and though the noodles felt more like knife-shaved noodles than true chow fun I quite enjoyed their heady wok fired char and delectably potent spice. 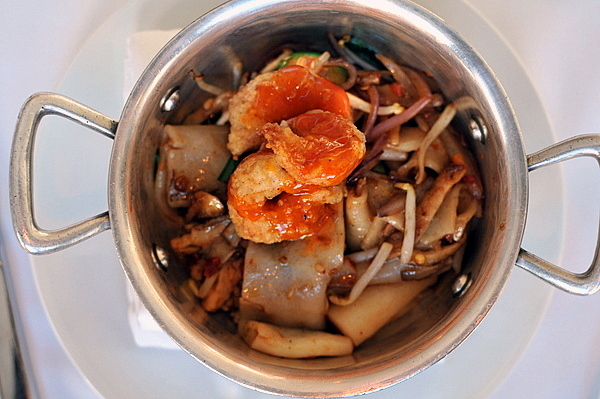 All things considered the dish would have been much better without the three severely overcooked shrimp. This was arguably the most traditional item on the menu, though Peking duck really feels more suited to dinner than dim sum. 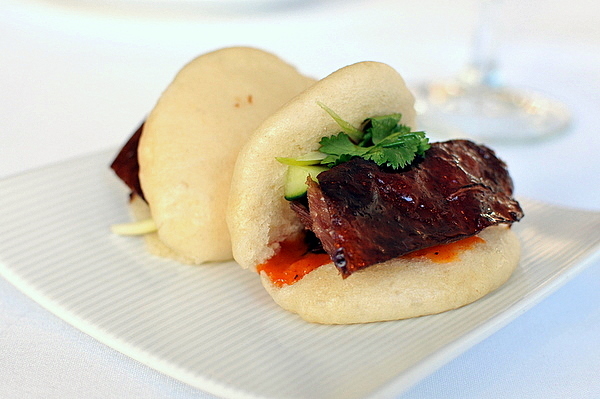 The skin itself was crisp and flavorful while the bun had a nice freshly steamed texture. My only complaint was the slice of duck breast, which felt a bit dry. 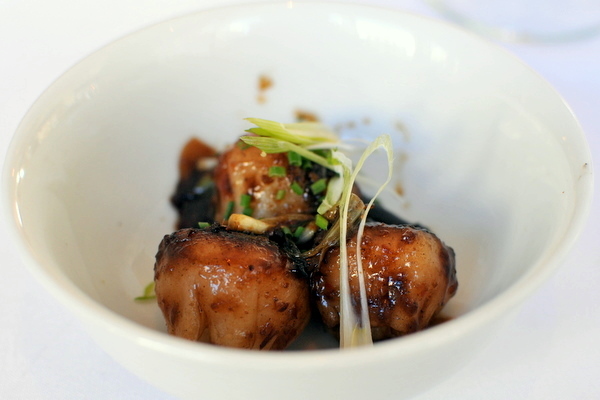 The last course consisted of three fried shrimp dumplings in what was allegedly "XO sauce" Instead of the expected umami and spice, the sauce tasted darkly sweet, more like black bean paste than XO. On the whole, I found the dim sum to be a bit clumsier and less refined than WP24's, but much of what I said about WP24 holds true for The Source as well. Though I didn't always enjoy the courses, I appreciated the creativity that went into them. The quality and experience are definitely a cut above the typical Chinese restaurant, but the price more than reflects it. At times I feel the meal emphasized style over substance, but putting aside my Monterey Park bias, I was able to enjoy the meal for what it was.